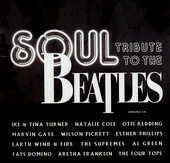 A collection of classic soul songs paying homage to The Beatles, Vanguard Records'Soul Tribute To The Beatles features everyone from Wilson PIckett ("Hey Jude"), Marvin Gaye ("Yesterday"), Arethra Franklin ("Let It Be"), Otis Redding ("Day Tripper"), and Al Green ("I Want To Hold Your Hand"). Also included are The Four Tops, Natalie Cole, Ike & Tina Turner, and Fats Domino, among others. Twelve tracks of pure, flawless soul re-do the Beatles, making the band's timeless lyrics sound new and re-invented, and answering the question, "What if the Beatles were a soul act?" Vanguard's Soul Tribute To The Beatles is executed so perfectly, compiled so nicely together, and produced so well, you can't help but fall in love with it. Even if you're not a Beatles fan, this is one must here. I'll give it an A+.